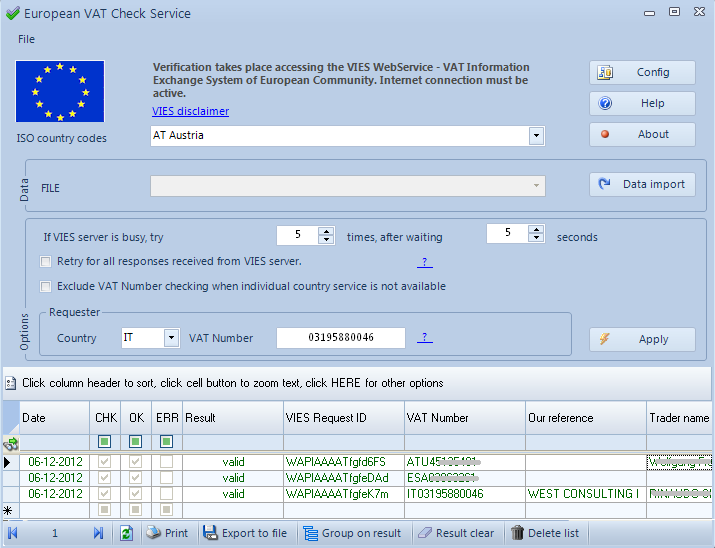 Connection to European Community VIES web-service (VAT Information Exchange System) to check if an operator VAT number is valid. Allows you to verify hundreds of VAT identification numbers issued by an European Member State. The verification is done against the national VAT database corresponding to the selected Member State. There is no VAT database at European Community level. In order to verify VAT numbers, your request is sent to the national database via a secure Intranet service connecting national Customs and Taxation administrations and the reply is sent back in a few seconds. Single-click verification of hundreds of VAT identification numbers got from external data sources. To get "VIES Request ID", unique consultation number useful if you have to prove to a tax administration of a Member State that you have checked a given VAT number. To print and/or export results to file. You can install this application on Windows Seven, Windows 10 o later versions. Operational requirement is an Internet connection. If your Internet connection uses a proxy, you have to configure it to allow conversation between software and VIES web-service. No, invalid VAT number (meaning that the number introduced is not valid at least on the date specified). Service unavailable. Please re-submit your request later. (meaning there is some problem with either the network or the Web application). Member State service unavailable. Please re-submit your request later. (meaning the application in the Member State whose VAT number you are trying to validate is not available). In the case of a valid VAT number, if the name and/or address are missing, this means that the Member State that issued the VAT number does not allow to disclose this information. If you put your own VAT identification number in the box requester's VAT identification number, the reply will contain a unique consultation number. File format is very simple: one VAT number each record. Record separator must be a new-line (CR+LF). After each VAT number you can append a space and a reference (for example, you customer name). NOTE: It is not possible to directly import an Excel file (.xls, .xlsx), however, since release 3.3.1 you can import from file .prn .txt (unicode/ms-dos/TAB delimited ...) obtained with theExcel function "Save As ...". You can print and/or export results to file, many file formats are available (PDF, XLS, ...). You can freely download this software and install it as trial version. 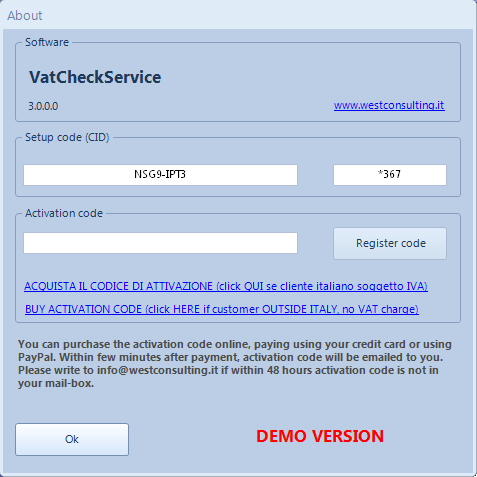 With demo version you can verify only three VAT Numbers at once, but you have no limits in order to import from a file. The activation code is valid for a single PC and based on the setup code generated from application first time it runs. A link on "About ..." window opens the payment page managed by PayPal site. Connection is absolutely secure and protected from fraud. After payment process completed, within minutes you will receive an email from PayPal as transaction confirmation and a second email from us containing your activation code. After payment confirmation we'll send you the receipted invoice. Please write to info@westconsulting.it if withing 48 hours activation code is not in your mail-box.